I love making my own homemade herbal bath and beauty products. Making soap was the one thing that I didn’t do for a long time, admittedly because I scared of the whole process. But when I finally did it, I realized it wasn’t really that bad. You can read about it in my post How to Make Soap for Beginners, which was completely inspired by the Natural Soap Making eBook by Jan Berry from the Nerdy Farm Wife (check out her awesome Soapmaking Success eCourse here!). Since I’ve started to make soap, I’ve also become interested in making shampoo bars. The process is the same as soap, but with different ingredients that are good for healthy hair. 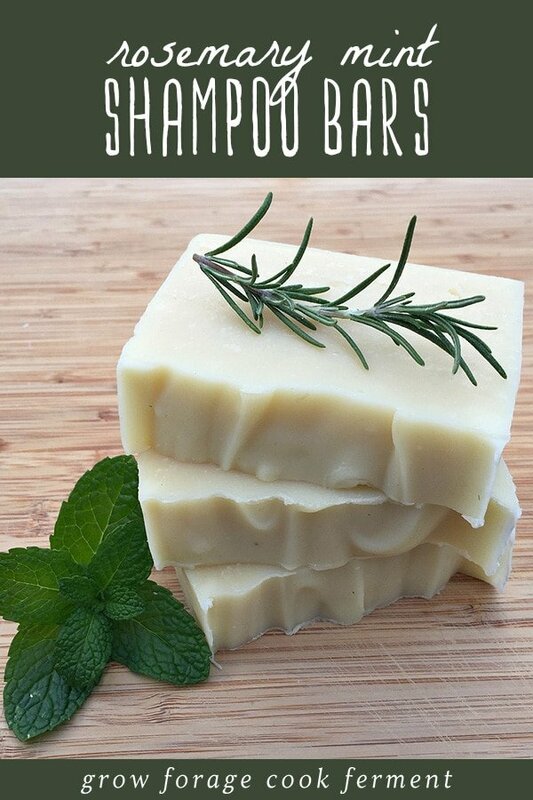 I’m sure you will love these homemade rosemary mint shampoo bars that I’m sharing with you today! 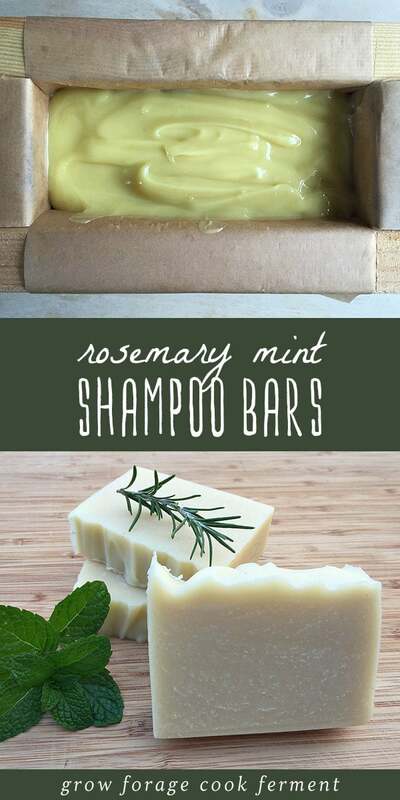 This recipe for rosemary mint shampoo bars comes from Jan Berry’s Natural Soap Making eBook package, and she has been so kind to let me to share it with you. 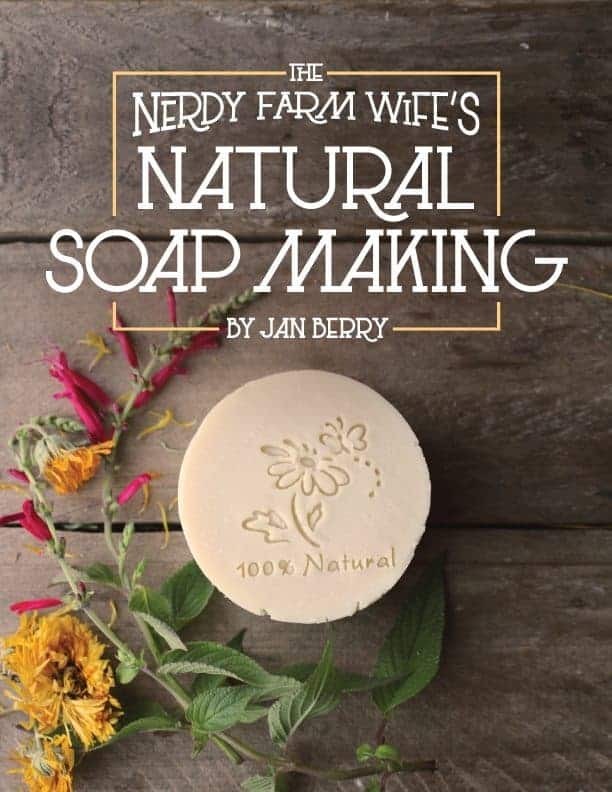 Besides the main book on soap making, she also offers a bundle that includes two companion eBooks: All Natural Milk Soaps and Natural Shampoo Bars. The bundle is so worth it and I’m so glad to have all of these awesome natural soap recipes at my fingertips. My favorite place for buying carrier oils, essential oils, and dried herbs for soap making is Mountain Rose Herbs. I get the lye from Essential Depot. For a more detailed list of equipment, or if you are new to making soap, please see my post on how to make soap for beginners, or get Jan’s Natural Soapmaking eBook. It goes into much more detail on the whole process and makes it all really clear for people who are just starting out. Wearing gloves, goggles & long sleeves, weigh the distilled water into a heatproof pitcher. Weigh the lye next, then carefully sprinkle and stir it into the water. Set the solution aside in a safe place to cool, while you measure out the oils. If making hot process soap, the lye solution only needs to cool for around 15 to 20 minutes. If making cold process soap, let it cool for 30 to 40 minutes first, so the temperature drops to around 100 to 110°F (38 to 43°C). Weigh and melt the coconut oil, then combine it with the other oils. This should bring the temperature up to somewhere around 90 to 100°F (32 to 38° C). Pour the lye solution into the oils. Using a combination of hand stirring and a stick (or immersion) blender, mix until trace is reached. 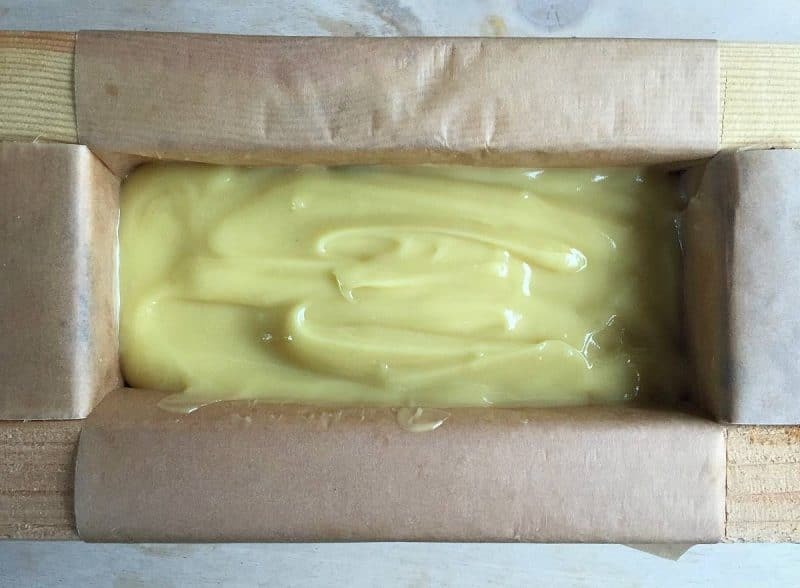 At this point, if making cold process soap, add the essential oils then pour directly into a mold, cover and insulate with a towel or blanket. Let the soap stay in the mold for 1 to 2 days, then remove from the mold and slice into bars. Cure in the open air for 4 to 6 weeks before use. If making hot process soap, you’ll need to further cook the soap in your crockpot or slow cooker. (Hot Process Version Only) Place the raw soap batter in a crockpot or slow cooker turned to low. Cook for 1 hour, stirring every 15 minutes. After the cook time is done, stir in the essential oils, then spoon into a mold. Let rest for 24 hours before cutting. Hot Process Soap can be used right away, but still benefits from a few weeks of cure time. The main difference between soap and shampoo bars is that shampoo bars are made with oils that are known for hair care, such as jojoba or argan oil. There are also herbs, such as the rosemary and mint that are used here, that are great for hair. There are many more herbs for the hair and scalp that you can read about in the eBook. Jan also talks about the importance of using a vinegar rinse with shampoo bars, and has a few great ideas and recipes for those as well. 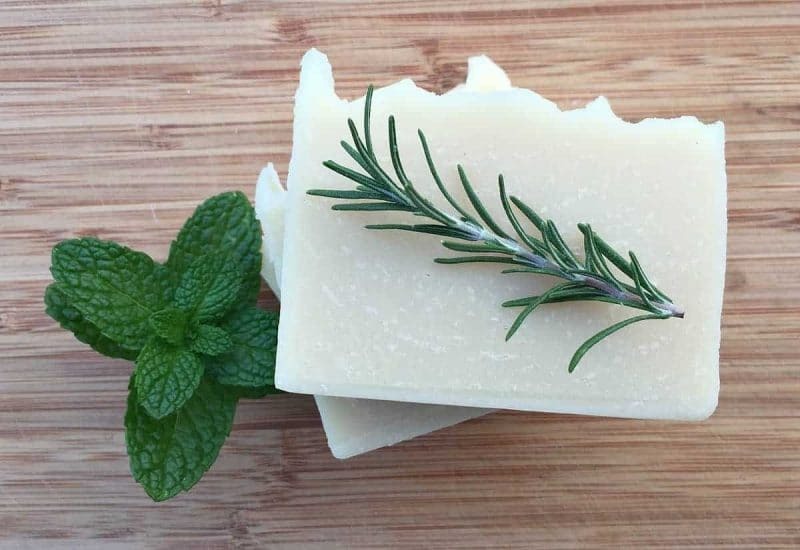 I think you will love these rosemary mint shampoo bars! To begin with, they smell absolutely amazing. They are pepperminty in a good way, and also herbaceous and piney from the rosemary. They are great for the hair of course, but you can use them just as regular soap as well. Check out Soapmaking Success to learn how to become more confident and adventurous in your soap making! I think I’m fully addicted to soap making now. I’ll never buy soap (or shampoo) again! Have you ever made or used shampoo bars? If making hot process soap, you'll need to further cook the soap in your crockpot or slow cooker. This is Jan Berry's recipe from the Natural Soap Making eBook bundle. For a more intense herbal experience, you can infuse a portion of the oils with dried rosemary and/or peppermint. Rosemary essential oil should be avoided if you’re pregnant or have hypertension or epilepsy. In these cases, you can omit it altogether or infuse a portion of your oils with dried rosemary leaf instead. This soap can be made using hot process or cold process method. If making hot process, use the full amount of water. 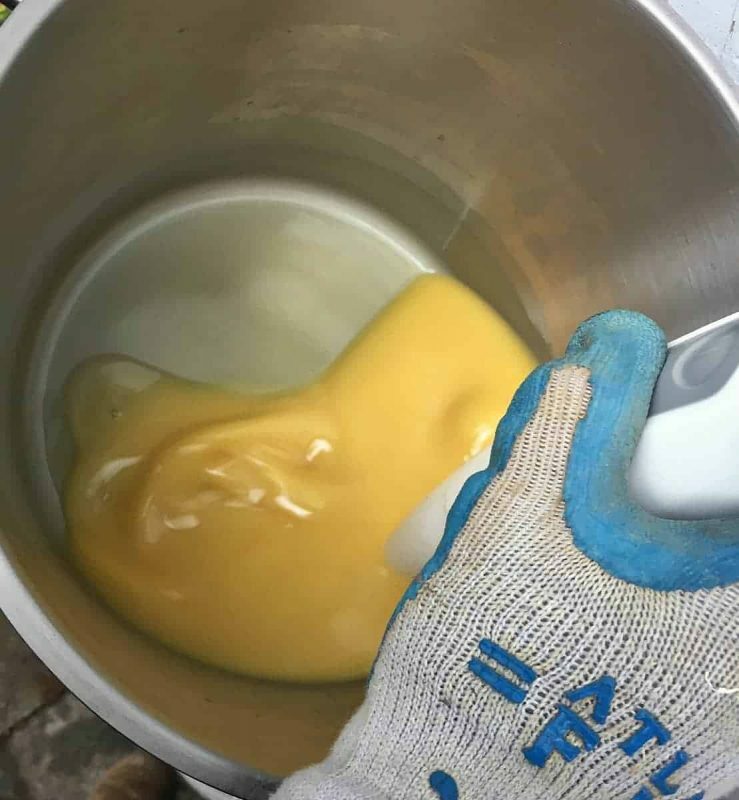 If making cold process, reduce the water amount to around 8.5 oz (241 g), so it will release from the mold easier. Superfat is 5%. For a 6% superfat, use 3.78 oz (107 g) of lye (sodium hydroxide) instead. Thank you for such an informational site and tips. Could we use cold process to make this shampoo bar? I want to make this for a friend who is allergic to coconut oil, is there a substitute? What size mold did this fit in? 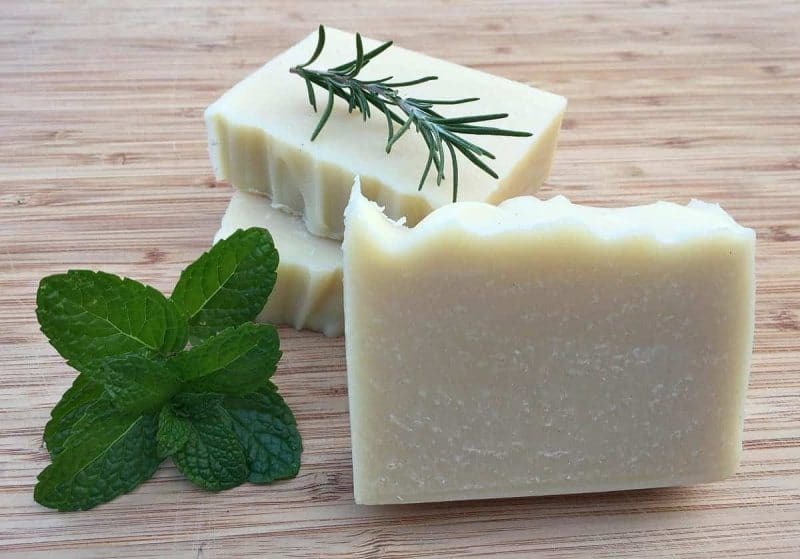 Hi there……I just finished making the Rosemary-Mint Shampoo bars. They smell amazing….but mine turned out rather yellow…..not beautiful white like the picture…..any suggestions? I make this and loveeeeeeeeee! Thanks very good!! I made this shampoo bar (hot process) I love it.. It’s just a little bit soft. I don’t know what I’ve missed! Is there any way I can fix it? Soft when removing from mold and cutting? Wait a 1/2 day longer. Soft when trying to use the bar? Let it cure a few weeks (lightly covered in a place where the extra moisture can evaporate). The longer you wait, the harder your bars become. I did this weekend at my mother’s house and it was amazing. Thanks for sharing! Simple, practical and delicious. I loved the result. Thanks for sharing! so will last years, depending on the size of your family. >We grate our soap an have been using it for laundry for several years. > One does not need all of those oils to make a great shampoo bar. You can use one, if it is olive oil, vegetable oil, or lard. and it is much cheaper as well. > I have discovered through experience that if you have shoulder-length or longer hair, the shampoo bars don’t ever seem to rinse out completely and your hair doesn’t feel clean. Do these bars work well on fine/oily hair? I’ve never used shampoo bars before but these sound great! Thanks for sharing. Excellent recipe, to own use and gift. Thanks a lot. I used the shampoo bars a lot and I’ve never had this problem! Axei it excellent. What kind of lye do you use? Is there any soap making books you know of that have chapters on shampoo bars? What oil can be substituted for the sunflower oil? I cannot find it anywhere and would like to make the shampoo bars tomorrow. When one uses a shampoo bar, what is used for conditioner? Or is conditioner not necessary? I made these shampoo bars using the hot process method and they came out as more of a tan caramel color. Not the pretty off white but they work beautifully and I love them. Thanks for sharing! Hello, how many bars does this make? 15 ml is the size of a large essential oil bottle and that is LOT and can be quite expensive. Thanks! It depends on how thick or thin you cut them, but around 10 large sized bars. Peppermint essential oil is usually on the cheaper end compared to other oils, and you can always use less if you’d like. I have not, but I will ask Jan Berry, the author of the eBook, if she has and what the results were. Hi…don’t you think, hair become sticky if using shampobar? I’ve used shampoo bars a lot and I’ve never had that issue! My (sensitive-skin) family have been using shampoo bars for a few years- it was so nice to find something that none of us have a sensitivity to! I make soap already- having read this I may be branching out into shampoo bars. I want to inspire you to live seasonally, become more self sufficient, and protect your health. I share information on foraging and wildcrafting, fermenting and preserving, cooking whole foods from scratch, permaculture gardening, and making herbal products. And that’s just the beginning! Read more here. Healing Herbal Infusions teaches aspiring home herbalists how to make natural plant-based remedies to treat a variety of common ailments and illnesses. Have questions or comments? Looking for an opportunity to work together?